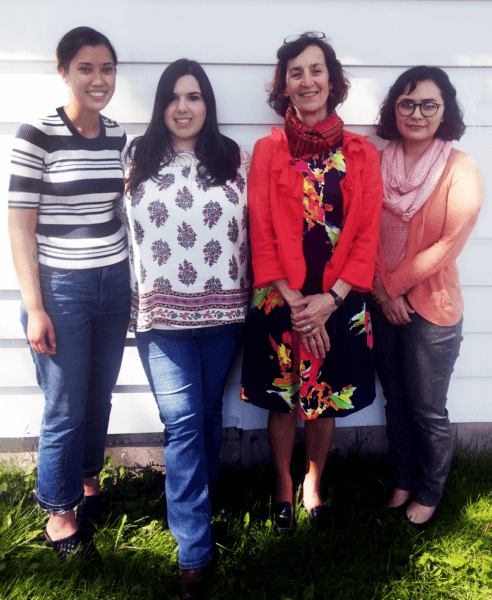 Amanda Sprandling, Markie Striegel, Dr. Catherine Raymond and Carmin Berchiolly will be spending much of their summer in research on south-east Asian art. Three NIU art history graduate students from the School of Art and Design will travel overseas this summer to pursue research on Southeast Asia as it relates to their master’s program. Carmin Berchiolly was selected by Oxford University and SOAS (School of Oriental and African Studies) University of London to attend a three-day workshop in Oxford, England, this summer in relation to her M.A. degree thesis on 19th-century studio portrait photography from the British Colonial period in Burma that became mass-produced postcards for Western consumption. Amanda Spradling was selected to attend a field school in art and archaeology in Singapore and Cambodia this summer for two weeks. Spradling was one of only 10 students chosen from around the world. She also received a summer Foreign Language and Area Studies (FLAS) Fellowship from the U. S. Department of Education (DoE) to study Thai language and Thai art history in Thailand for eight weeks. These opportunities enhance her thesis research into early terra-cotta traditions of mainland Southeast Asia, including Myanmar, Thailand and Cambodia. Markie Striegel also received a FLAS from the DoE to study the Burmese language at NIU, which will cover the cost of her study for 2017-18 and fieldwork in Burma this summer for the study of ancient patterns in Burmese textiles. Spradling and Striegel applied for the FLAS through NIU. The Center for Southeast Asian Studies (CSEAS) is given a certain amount of money each year from the DoE and then CSEAS reviews the applications and chooses how to disperse the money. The fellowship is to foster the study of rare language and area studies to improve American relations with other countries. The three graduate students from the School of Art and Design will also join art history professor and Center for Burma Studies Director Dr. Catherine Raymond for a field trip to Southeast Asia this summer not only to mount an exhibit of “The Tradition of Burmese Reverse Glass Painting” in Burma, but also to visit the various historical sites and archives related to their research. “These students have been working diligently this past year to advance their research topics. Their fellowships, scholarships, and grants attest to their commitment and hard work. Each of them have different interests related to Southeast Asia on topics that have not been widely studied. Their projects will be valuable contributions to their fields,” explained Raymond, who was chosen as a 2017 Presidential Engagement Professor in April.